Another sultry dawned on Monday 23rd may as the Pattaya Golf Society travelled to Khao Kheow to play a stableford competition off the yellow tees on the B and C nines. The course was quite well grassed with greens billed as 9.5 but running slower – at least some of them – and a steady strong breeze all joined to conspire against the all but aware golfer. A tight competition ensued and Andrew Purdie, with the best gross of the day, 82 shots, shared third place with Mike Firkin on 34 points. Japanese golfer Hisahiko Makino took second with 35 points, leaving Gary Bolger as the only sub-par golfer on 37 points. It was a round of quality on a course and in conditions which tested most golfers and Gary is to be congratulated on a fine performance. There were no birdie ‘2’s and the Booby Bevy went to Mike Wilsher, former hero, now zero,after he managed an 8-17 split. It was good to be on a grassed course again but as the seasonal rain increases more quality courses will be back “online”, as was Khao Kheow on Monday. A fair test, don’t you think, Treasure Hill off the whites, all 6725 yards, in very humid conditions with the back nine greens having been cored and sanded? 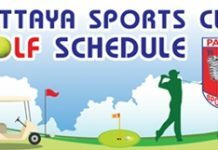 Of course someone forgot that it was the Pattaya Golf Society which had booked in for the challenge on Wednesday, 25th May and the gloves were off. The lads were certainly up for it and scores were close as a result of skill in good measure and good luck in parts, no more so than when Dave Edwards chalked up the only birdie ‘2’ of the day when a thinned eight-iron from fifteen yards rattled off the pin into the hole on the seventeenth. Elsewhere solid golf saw Garry Hookey take third place with 33 points, his only blank coming on the relatively easy tenth. Sharing first place were Monday’s heroes Andrew Purdie and Gary Bolger on 34 points. Andrew’s gross of 81 was the best of the day and Gary had volunteered a one shot cut after his sub-par round two days previously. Honours remained even. reputations remained intact and Treasure Hill will wait anxiously for the PGS to return in a couple of weeks to take up the gauntlet again. On Friday 27th May the Pattaya Golf Society visited Silky Oak to play a medal competition on the green and well grassed course. Greens were very true and running at no more than a medium pace and an empty course made for a very convivial day. The small field set off on time and finished well within four hours, with Mike Wilsher again coming up trumps with net 75 for second place but once again this week it was Gary Bolger who stole all the headlines with his net 69 giving him his third win in three and his second sub-par round. Both the leaders recorded birdie ‘2’s, Mike on hole 3 and Gary on hole 16. Of course others were playing as well with the usual mixed bag of scores and stories of ill luck and missed chances. Once again it was a pleasure to be hitting off grass and not compacted clay or dust. If there was a complaint against Silky Oak it could be the lack of watering holes. With only one available at present on the course and visited only once at the fifth golfers run a serious risk of dehydration in the current drought and it is recommended to stock up well before teeing off.